Explore Marseille and discover the delights of France’s oldest city. This colourful port, founded by Greek traders, incorporates influences from its wealth of diverse visitors down the centuries. From the Greeks, Persians and Romans through to the Corsicans, Spanish and North Africans – every one of them has left a mark on the city that can still be seen to this day. Most recently, it’s been the turn of modern city planners with their designer hotels, galleries, chic restaurants and shops to make Marseille a truly world-class destination. Hiring your car from us is hassle free, with no hidden extras to pay. 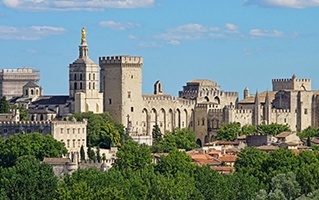 We have several pick-up locations in the city, including at the main railway station and Marseille Provence Airport, so you can quickly get out on to the road to explore the many marvellous sights of Western Provence. Choose your car from our extensive collection and whether you opt for a compact city car, a larger sedan or an SUV, we’ll aim to have you out and on the road as quickly and conveniently as possible. The main attraction of Marseille is its unique atmosphere, but make time to explore the more sedate pleasures of this fascinating part of the Provence coast and you’ll unlock a wealth of treasures. Marseille’s focal point has always been its Old Port (Vieux Port) and it remains the case today, even if the trading ships have been replaced with pleasure craft. Discover this picturesque area with a serene breakfast time stroll as the fishermen land the day’s catch for the morning fish market on the Quai des Belges. The quayside is lined with bars and cafés, perfect for an espresso as you watch the locals coming and going. On the north side of the port is Musée des Civilisations de l'Europe et de la Méditerranée (MuCEM), opened to huge acclaim when the city was named European Capital of Culture. Standing next to the 17th-century Fort Saint-Jean, MuCEM is a genuinely world-class museum which charts the history of European and Mediterranean society through the ages, right up to the modern day. Overlooking Marseille from the south side of the old port is the beautiful Romano-Byzantine church of Notre-Dame-de-la-Garde, the city’s most visited sight. It’s topped by a 10-metre gold leaf statue of Virgin and Child, visible from everywhere in the city. As in the rest of Provence, the food in Marseille will be a big part of your stay. The city’s signature dish is bouillabaisse, which is well worth sampling while you’re here. The stock is served first as a soup, followed by a five-fish stew. A good place to try this classic is at Chez Madie Les Galinettes, situated at the Vieux Port. This friendly, bustling restaurant also serves up other local specialities, such as the delicious daube beef in wine. 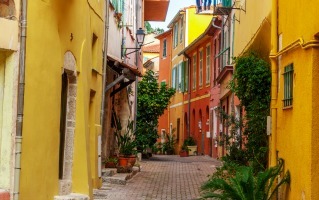 The town of Cassis is only a few kilometres east of Marseille, but couldn’t be more different. This quintessentially charming Provençal seaside town is a sheer delight to explore, but don’t miss the chance to try a boat trip to the famous Calanques, the limestone cliffs and creeks of dazzling aquamarine water that stretch for 30 kilometres to the west of Cassis. This is one of the most dramatic coastlines on the French Mediterranean and among the best day trips in the area. Buy your tickets at one of the many booths on Quai Saint-Pierre. Make time for a visit to the classy and cultivated university city of Aix-en-Provence, once home to the artist Paul Cézanne. The main strip, the Cours Mirabeau, is the most elegant thoroughfare in southern France. To the north of here is Vieil Aix, the Old Town, while to the south sits the remarkable Mazarin quarter, a grid of handsome 17th- and 18th-century townhouses. For such a small city, Aix has some great shops. The highest concentration of designer boutiques can be found on Rue Granet. Also here is the Musée Granet, with its impressive collection of 19th-century art including works by Van Gogh, Monet and, of course, Cézanne. Extend your visit and stop here for lunch at Le Bistrot, a classic French restaurant on Rue Campra, where you can tuck into home-made terrine and tartare de charolais (steak tartare). Car hire in Marseille gives you the freedom to make your way around the city at your own pace, as well as the opportunity to venture further afield to explore more of this beautiful region of France. Hiring a car is the best way to get around and explore this beautiful part of Provence. Driving in Marseille is fairly straightforward, thanks to the efficient road network and a series of tunnels that connect the Vieux Port with the main Autoroutes. The A50 heads east to Cassis and beyond, while the A7 and A55 point west to Aix. A tunnel also links the north side of the port with the south side, making it easy to get across the city centre. If you’re visiting the Vieux Port area, it’s best to avoid trying to park on the street. Marseille has a lot of narrow and one-way streets and local drivers are used to parking anywhere, even double or triple parking. Instead, use one of the main car parks in the city centre, which are in plentiful supply. The speed limit on motorways – Autoroutes – is 130km/h (110km/h in wet conditions). Autoroutes are toll roads, indicated by blue signs and marked ‘Péage’. Dual carriageways are indicated by green road signs with a speed limit of 110km/h (100km/h when wet). The speed limit on main single carriageway roads is 90km/h (80km/h in wet conditions) and it drops to 50km/h in built-up areas. When buying petrol, note that Sans plomb is unleaded and Gazole is diesel. As in the rest of mainland Europe, in France you’ll be driving on the right-hand side of the road.